You’d think in 2018 the idea of stereotyped gender roles would be a thing of the past. While we have certainly progressed as a society in numerous ways, when you scratch a little below the surface, you sadly don’t have to look to far to find mindsets and attitudes belonging in the 1950’s. Laws can change, but it takes a much longer time to transform cultural attitudes. Visual reminders and comparisons have a way of becoming a powerful tool for transformation, as we can see in artist, director and photographer Eli Rezkallah’s brilliant series, ‘In A Parallel Universe’. Based out of Lebanon, Eli’s project has caught the attention of worldwide press, including Buzzfeed, The Daily Mail, and The Huffington Post. 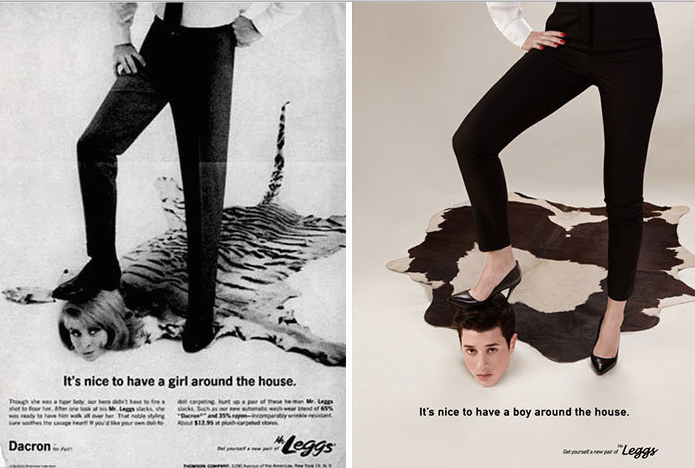 He has taken some very recognizable, and dare we even say “iconic”, advertising images from a decades ago and flipped the gender roles, as a way to point out just how ridiculous and sexist they are, and how ridiculous gender roles in general are. 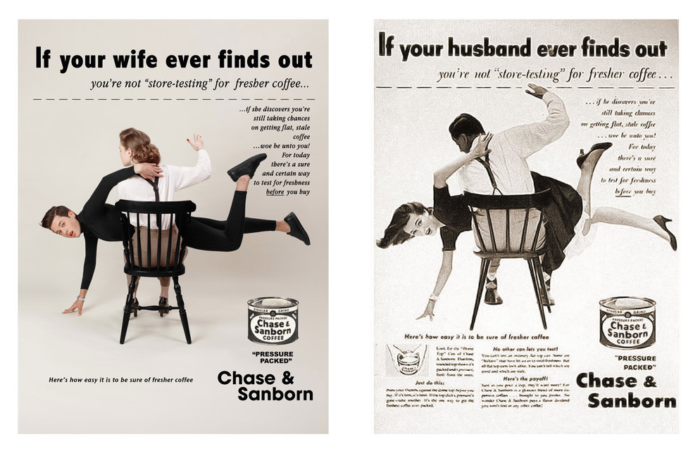 With advertising that depicts women in domestic situations such as cooking and cleaning, Eli placed the men in those situations and kept the verbiage the same except for the flipped gender pronouns. If your first reaction to seeing men in a typically domesticated or submissive situation is one of discomfort but the image of the women didn’t elicit the same response, now is a good time to challenge yourself and ask “why not?”. Eli explained that the idea for this project came after a Thanksgiving gathering with his family where he overheard certain extended family members talking about women in a way reflective of a bygone era. “Last Thanksgiving, I overheard my uncles talk about how women are better off cooking, taking care of the kitchen, and fulfilling ‘their womanly duties’. Although I know that not all men think that way I was surprised to learn that some still do, so I went on to imagine a parallel universe, where roles are inverted and men are given a taste of their own sexist poison,” he said. On January 10 he posted about his series on his Twitter account, and included the #TimesUp hashtag, which is the organization founded by a group of A-list and powerful women in Hollywood, designed to advocate and protect women who are being harassed, abused or intimidated in the workplace but are too afraid to speak out in fear of financial repercussion. 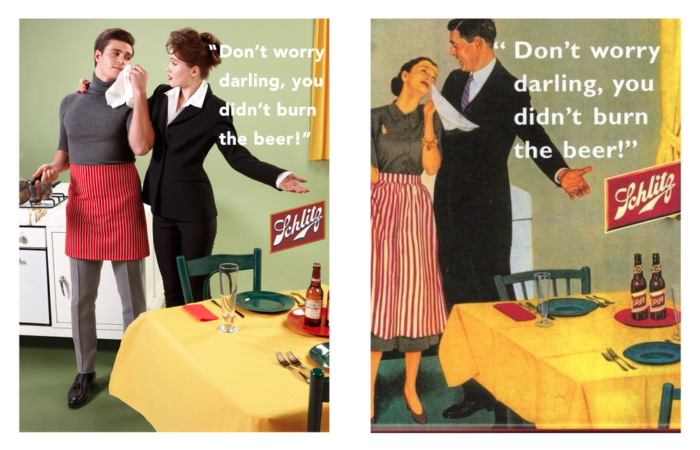 In light of the #MeToo movement which has brought to light a long string of horrendous stories from various industries (film, politics, gymnastics, newsmedia) where men in powerful positions have gotten away with abusive and coercive behavior toward women, it’s easy to draw parallels between what was depicted as the norm in advertising for many years, and what was allowed to happen in the workplace for far too long. Time is indeed up for protecting the misogynistic attitudes that have permeated almost every part of our society, both public and private. By using his artistic skills to add to the conversation, Eli is allowing people to be challenged by what they see in his series. We have seen quite a few in-your-face campaigns exposing the sexist foundation of the advertising industry, which has been instrumental in shaping attitudes and opinions about women and women’s bodies for many, many years. 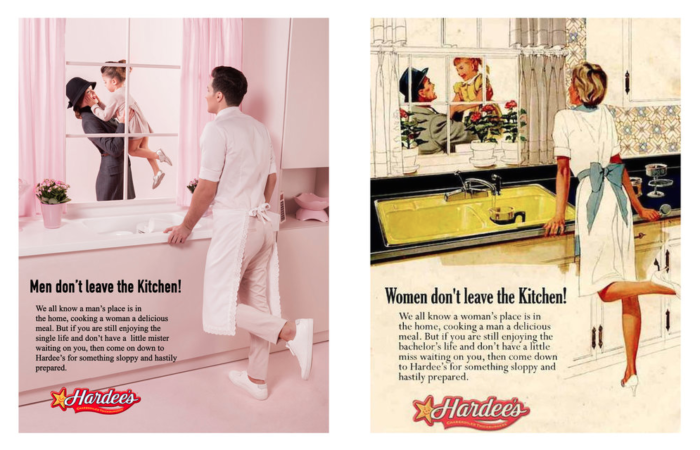 With popular and recognizable brands seemingly not thinking twice about giving sexism a signal boost with their campaign imagery, a simple gender reversal as shown in ‘In A Parallel Universe’ should be a wake-up call to any company that still hasn’t gotten the message that “time’s up” on using sexism to sell a product. Aside from his photography and art, Eli is also the founder of Plastik Studios and Plastik Magazine, which offer services in photography, film, events, branding & design. You can see more of his work on his website, as well as the rest of the images from the ‘In A Parallel Universe’ series. I am shocked by some of the ads. My god, it’s no wonder things have gotten as bad as they are. Women on the floor, being stepped on, and somehow this was acceptable? No wonder some women don’t ‘get it’ today when they grew up surrounded by media casting them as incompetent and rugs to wipe your feet on.